What’s a bowl of Hor Hee you ask? 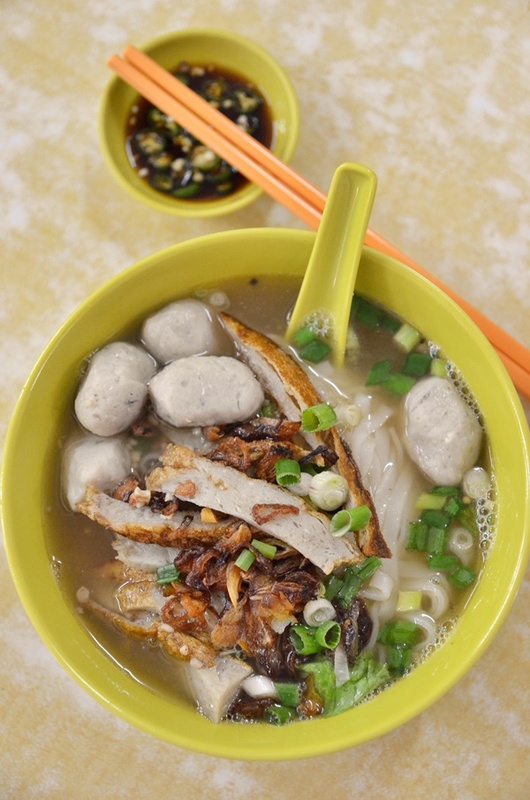 To many others from other states, a bowl of Hor Hee looks just like Penang’s version of Kuey Teow Th’ng or a typical bowl of fish ball noodle soup in Kuala Lumpur. Well, you could be right to some extent. 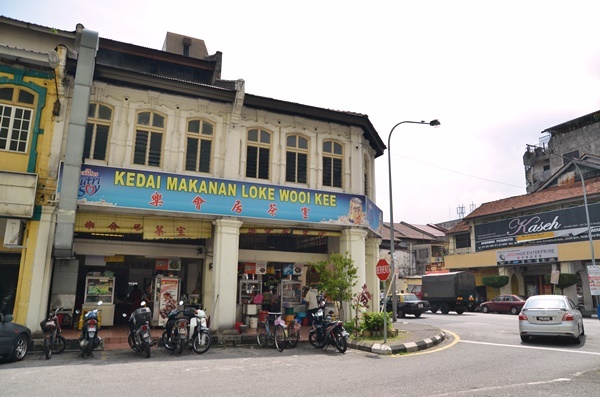 Ipoh Hor Hee is essentially fish ball and fish cake noodles where Ipoh sar hor fun (kuey teow/flat rice noodles) or glass vermicelli noodles (tang hoon) is your default choice of noodles. However, the difference lies in the addition of fragrant fried garlic and fried shallots, and some outlets even include diced choy poh (preserved turnip) for additional crunch and taste. At Loke Wooi Kee, the Hor Hee stall has been around for as long as I can remember. This was once our quick lunch before our Jurassic Park movie outing at Rex cinema back in the late 90s. The clear broth still has this comforting, peppery kick with a subtle umami flavour. The irregular shaped fish balls and sliced fried fish cakes are not machine-made; the greyish hue is a sure giveaway and once you sink your teeth into them, you should be able to tell the difference. At Loke Wooi Kee, they serve their Hor Hee steaming hot garnished with a handful of chopped scallions and a side saucer plate of bird’s eye chillies in soy sauce. Although personally I prefer Ipoh Old Town’s Li Heng Fatt version to LWK’s, this may be one of the best bowl of fish ball noodles you can find in Ipoh. 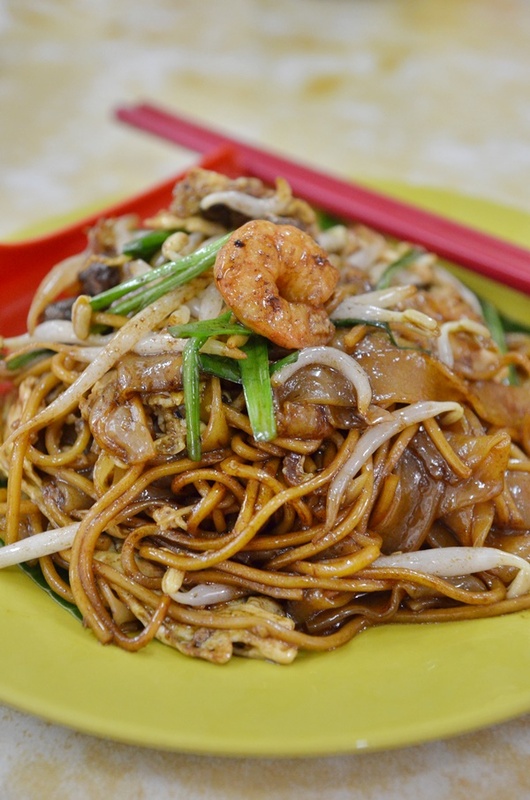 Aside from Hor Hee, the adjacent stall serves a pretty famous Chicken Kuey Teow (or Kai See Hor Fun), another of Ipoh’s staples when it comes to hawker food. However, if your idea of a satisfying, sinful street food crawl in Ipoh does not include tummy-warming soupy noodles, then do give the Char Kuey Teow stall a try. The hawker still fries the noodles the traditional way; noodles coated in dark soy sauce, with bean sprouts, Chinese chives (ku chai), eggs, shrimps, cockles and even slices of waxed sausages (lap cheong). Although a true Penang Char Kuey Teow fanatic may frown at the sight of lap cheong in his plate of CKT, this is completely acceptable in Ipoh really. The smoky aroma imparted by the well-heated wok (known as “wok hei’”) was present; a showcase of the stall owner’s mastery in controlling the fire. Quite a surprise actually, as I was not drawn to Loke Wooi Kee because of the CKT, and now it seems that this has surpassed all our expectations. If you wish for something to share, like how Ipoh street food should be savoured, try the rojak from Choong Sun Rojak Stall; a classic name from Old Town back in the golden years of tin mining. 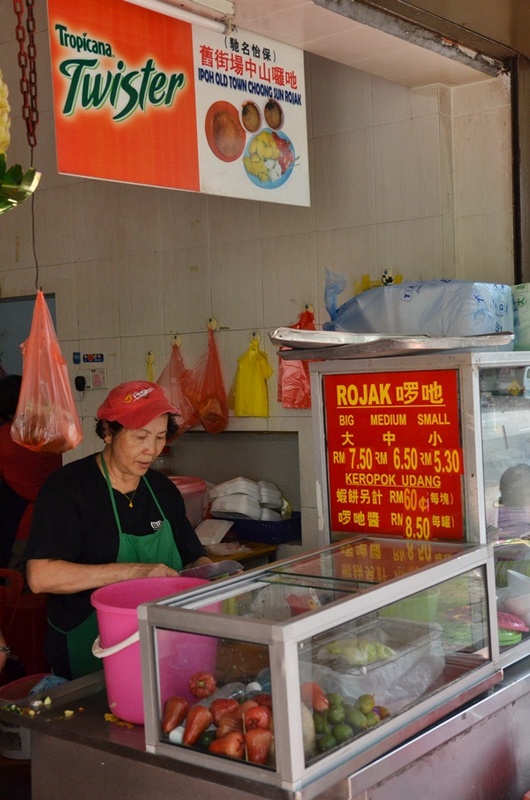 Now operated by the next generation, a woman who claims that the originator is her uncle serves the rojak sauce separately from the freshly cut fruits and prawn crackers. 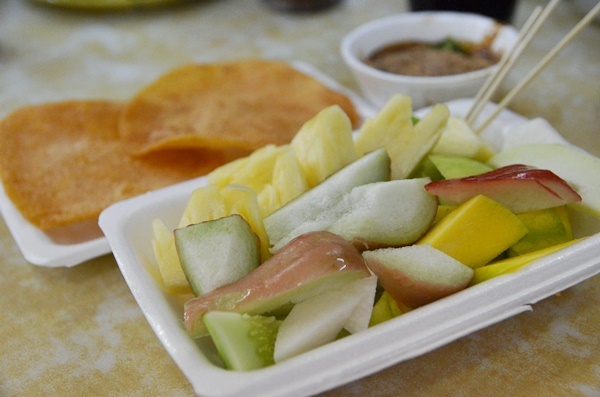 The crackers stole the limelight this time, although I could not fault her choice of juicy rose apple (jambu air), pineapple, mango, cucumber and sengkuang (jicama) either. When dipped into the lusciously sticky black sauce concocted from shrimp paste, crushed peanuts, sugar and some chopped bird’s eye chillies (optional, depending on your preference for spiciness), the prawn crackers could be really addictive. We ended up packing some home for snacking later in the evening. Still craving for more? 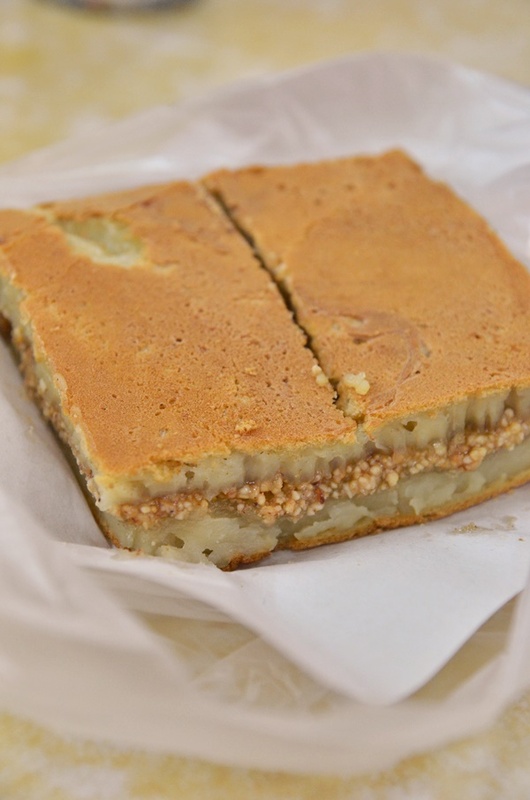 Then, look for a sweet ending with the Apom Balik; soft confection made of flour sandwiching a filling of crushed peanuts and sugar. Or share a serving of savoury fresh popiah stuffed with a myriad of vegetables, lightly brushed with chili and sweet sauce. 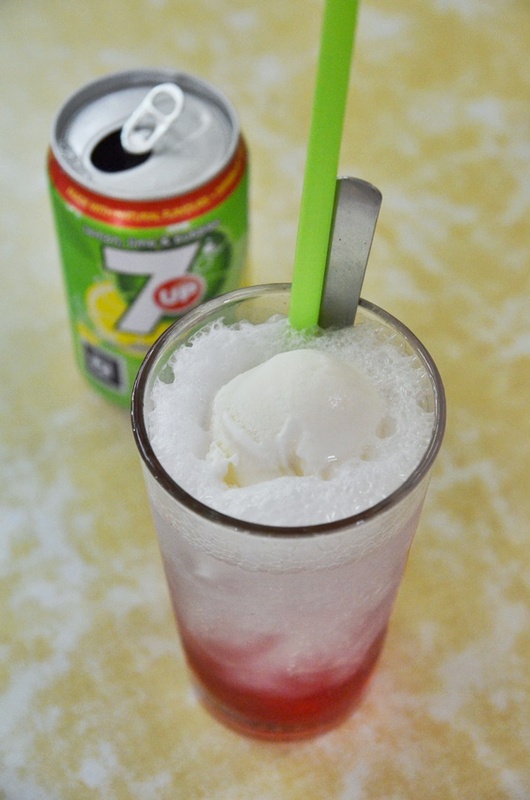 And the Loke Wooi Kee experience is not complete until you try their famed 7 Up Float; a mixture of red syrup, 7 Up carbonated drink and a scoop of vanilla ice-cream. This is almost guaranteed to send you to sugar haven, or warp you back to your childhood. *Opposite of KAMDAR in Ipoh, near to Aun Kheng Lim Salted Chicken, Purple Cane Tea House and within walking distance to famous bean sprouts chicken outlets. The hor hee had been around since the 60s. Back then, along the roadside infront of Look Wooi Kee, there were a few Indian street stalls selling delicious mee goreng, rojak & mee rebus. The Ho Hee was there since the 50s. Then, I am older than you guys. U shld try the hor hee at stadium ipoh perak which operates only night time. Being a Sg Siput boy…..this LWK is an important part of my childhood!! Especially the Seven Up Float!